Bacon, ranch flavor, green onions, cheddar cheese, and crunchy pecans come together in this amazing cheese ball! 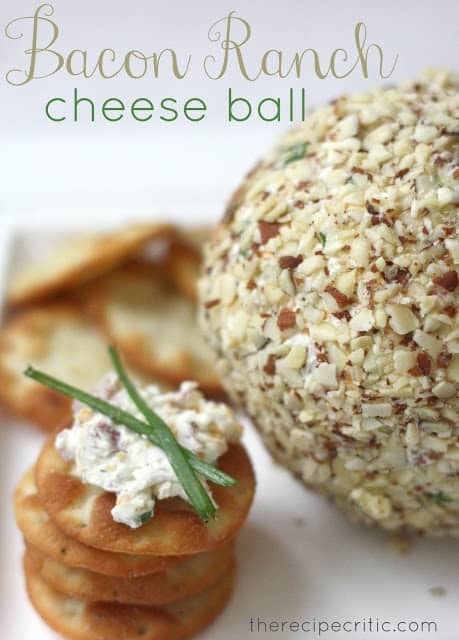 It is my absolute favorite and most popular cheeseball on the site and will be a hit wherever it goes! December is full of holiday parties and get togethers. 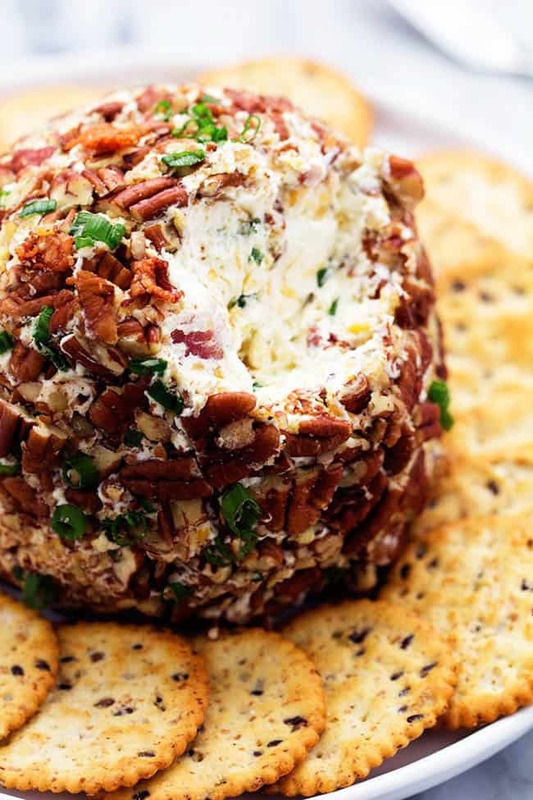 And in my opinion, cheeseballs are a must at any gathering! They are delicious and so simple to make. 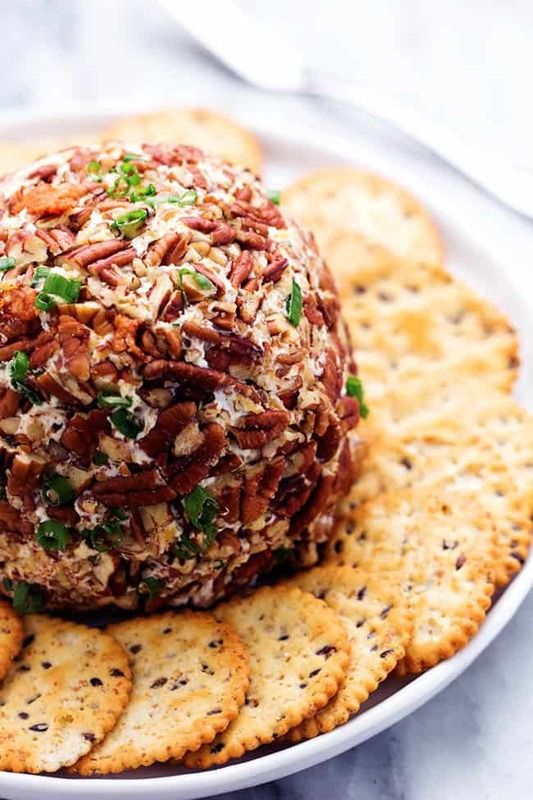 This cheeseball has so many amazing flavors combined. 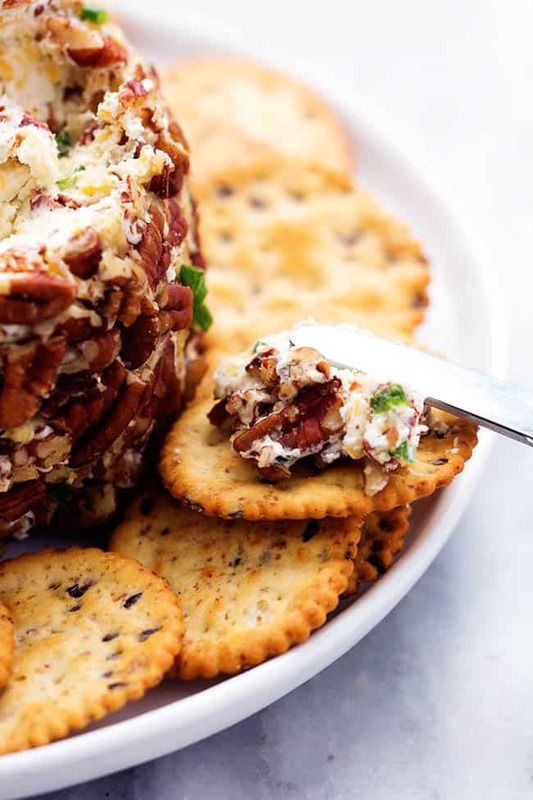 Ranch flavor, green onions, cheddar cheese, and crunchy pecans. And don’t forget the bacon. Bacon makes everything better and adds such great flavor! The year that I made this, I was looking for a fun new neighbor gift idea. I decided to divide the cheeseball up and give them to my neighbors with some crackers. It was a huge hit. My dad loved it so much that he made me come and make some for his neighbors. Man, the perks of having your daughter be The Recipe Critic! ? I know that you will enjoy this recipe just as much as our families and neighbors did! You can’t ever go wring with such a delicious flavor combination! People will be asking you for the recipe and it is sure to be a huge hit! This is definitely a five star cheeseball in my book! 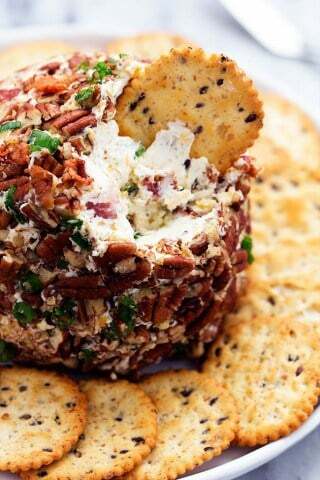 Mix together the cream cheese and dry ranch packet. I put mine in the mixer and used the paddle attatchment. That made it so easy. Otherwise, mix in a bowl until smooth. Add the cheese, onions, olive if using and bacon. If you are short on time, buy the real bacon bits and add about a ½ cup. Shape into a ball. Roll it in the nuts to coat the outside. You can make one big ball or two smaller ones. Keep it stored in the refrigerator. The first time that I made this recipe I used almonds. But since I only had pecans on hand I used them. Feel free to use whichever you would like! I also forgot the sliced olives (again!) but that would be a yummy addition as well! Made it last week for a shower trial run and it was delicious! Thanks for sharing a great recipe. Easy, quick and tasty! Thanks so much for sharing! I made this like three times, and it’s always a huge hit. I love this recipe so much that I’m linking your page to my blog. Take care! I wanted some clarification on the Ranch packet mix……the “buttermilk” only comes in 0.4 oz. dry packets where as the REGULAR ranch dry mix comes in 1 oz. packets. IS THERE A DIFFERENCE? Thanks! Can u prepare this and freeze?? I made this today for tomorrow’s New Years munchies. Had a taste and it is so yummy. Sans olives as very few people in my family like them we put those yucky things in a bowl for those who do like them lol ?Happy New Year and thanks for sharing your recipe ?? what kind of crackers did you use with the dip? 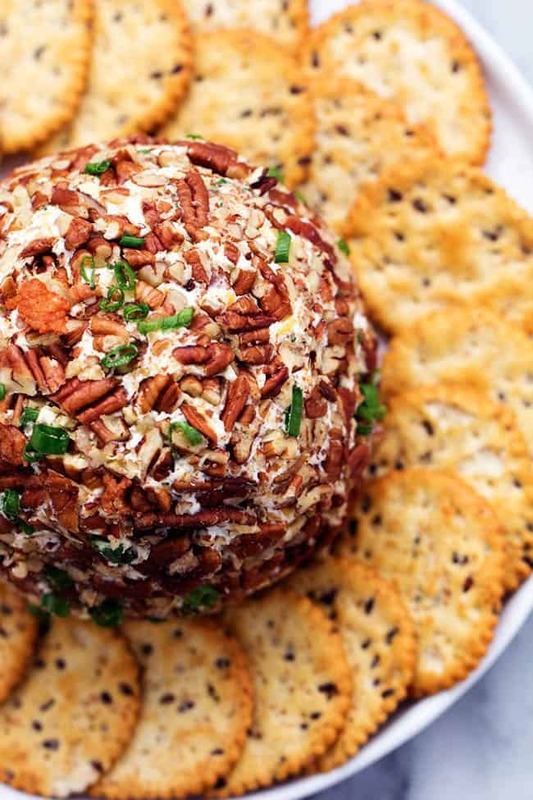 I like to use a buttery cracker but any cracker will taste great with this cheese ball. Do you think this is gluten free? No, unfortunately it is not. You are welcome to make it GF though, if that is what you need. For those who can’t eat nuts, what would be a good alternative to the pecans? The only thing I can think of is to crush some pretzels…. Maybe bacon crumbles and finely shredded cheddar, mixed with finely chopped green onions and/or parsley? What cracker did you use in the video? That’s the cracker I want because they look like they would hold up well. I got them from Costco in a package of 5 or 6 varieties. I am not sure what they are called though. Very delicious, thank you for sharing. Also, when you gifted them out to neighbors,…what did you wrap the cheeseball with ? what kind of crackers are those? they look delicious!